Before I became a Stay At Home Dad I was a teacher. I taught fifth grade for one year and then seventh grade science for five more years. I absolutely loved my teaching job as I was paid to get hormonally-challenged 12 and 13 year olds excited about science. Why would I love that? Because I got paid to blow things up and/or light stuff on fire. Okay, there was also a lot of actual scientific stuff but that’s not the point. Despite my love for fire (safety, of course! ), my favorite unit of the year was the six weeks we spent on Physics, studying Newton’s Laws of Motion, among other things. I’m guessing that many of you are having trouble reading this because your eyes are starting to glaze over at the mere mention of science. Please, stay with me. I promise I’ll try to make it fun. 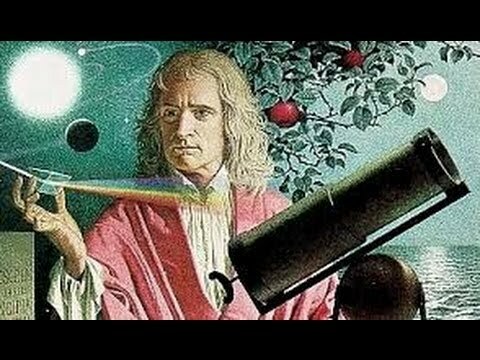 You might even recall learning about Sir Isaac Newton, that famous guy who is credited with “discovering” gravity when he observed an apple fall from a tree. Sadly, it didn’t actually fall on his head like those Saturday morning cartoons portrayed it. Newton’s First Law, also called the Law of Inertia. Simply put, a body at rest stays at rest and a body in motion stays in motion, unless acted upon by another force. This could be renamed the Law of Sleeping In. Or the Law of Not Helping With Chores. Or the Law of Netflix. If you have teenagers in your life then you know that asking them to do anything before noon during the summer or weekend is pretty much not going to happen. Unless it’s something that they want to do, in which case they can be up and at ’em by 7 am or earlier. Trip to Six Flags leaves at 6:30 am? No problem. Could you please take out the trash by 8 am? No way. I’ll be sleeping. The motion part of this applies to toddlers/preschoolers. Once they’re awake it’s GO TIME! There is no slowing them down. They run (or crawl) everywhere. Sit down to eat? Maybe for a couple of minutes but they’re going to be squirming the whole time. Stop playing and go use the potty? Not a chance. And don’t bother trying to get them to wash their hands. And don’t get me started on bed time. Ha! 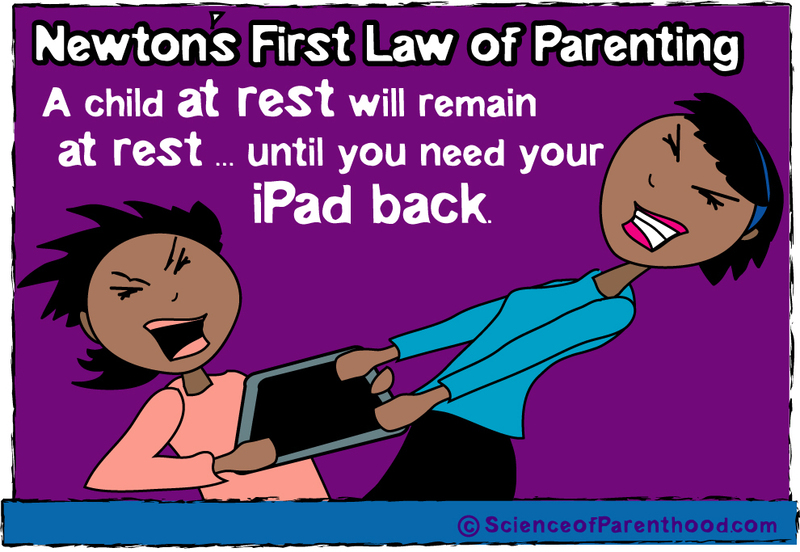 Of course, Newton understood something that we as parents often forget. We have power. Use the force! (Wrong force, but I had to drop that in there.) Amazingly enough, we can help direct our children to change what they’re doing through a variety of methods, hopefully more creative and kinder than using actual force. Unless you lick your hand…it’s a joke my 10 year old taught me. Be the force that changes lives for the better. His Second Law states that Force = mass x acceleration. You unknowingly apply this truth whenever you drive your car or even toss a ball to your child. If you want your car to go faster you need to press the gas pedal giving it more force. If you want to throw the ball down the hall so your kid has to go farther to retrieve it so you can play several turns on Candy Crush (shame on you, pay attention to you kid!) then you know that you have to use a small ball (less mass) and throw it with enough force. Hopefully you have good aim. But how does this apply to parenting? It doesn’t. It’s about motion. Kidding. Really, though, I like to think of this as showing that you don’t always have to use a lot of force to be a good parent. Sometimes being strong and forceful isn’t what’s needed. Maybe your kid needs you to lighten up a little bit and change the pace from the usual big bad wolf parenting that’s easily assumed. Run around with them. Have a sense of humor. Keep them on their toes. Be quick-witted. Push them to succeed without being oppressive. It’s a delicate balance that may need to be tweaked daily. If you’re too heavy-handed in your approach then you might force your child away. By the same token, you can draw your children to you (think of it as a reverse force or gravity) if you’re full of love and joy and patience. The Third Law is the Action-Reaction Law. “For every action, there is an equal and opposite reaction.” It’s rocket science. Really. Balloons whooshing through the air if you let go of the untied end after blowing it up. It’s that toy that you see with five steel balls in a row suspended by string. One of my favorite toys from my grandparents’ house when I was a kid. This one is pretty easy to apply to parenting. Ever try to tell a toddler or teenager “no”? What’s the usual response? They do the opposite. Please don’t eat the dog food. Chomp. Chomp. Please set the table. Please leave your brother/sister alone. I suppose it’s all part of the push for independence in our kids. At some point they’re probably going to have to make decisions on their own and they won’t always be the ones we would choose for them. But, here’s the thing. As parents, we can help guide the direction of our young “rockets”. They don’t have to be like the aimless balloon going crazy all over the place. With some self-control and perhaps a fair amount of tongue-biting we can help give some direction to our children, starting when they’re young and innocent and continuing on all they way into their teenage years and beyond. My oldest is 19 and moved out two days after graduating from high school about 14 months ago. Yet, my parenting with her is not finished. She still calls and texts me (almost daily!) to ask for advice or simply to talk. Just because she’s not living at home now doesn’t mean my job is finished. My influence may not be as evident with her now as it is with my toddler, preschooler or my school-age children still at home, but it’s still significant. And all six of my kids are watching my actions just as much as I’m watching their reactions. Whether we admit it to ourselves or not, our actions influence the lives of our children. I hope my nerdy application of Sir Isaac Newton’s Laws of Motion to modern parenting was as entertaining for you as it was in my mind. If you like my action here, please give me some reaction by commenting, liking or sharing this across social media. It was entertaining and educational. Some wisdom and laughs too. The law of sleeping in was particularly amusing. I taught well before Angry Birds ever existed, but I can imagine how fun that would be to use to, um, demonstrate Newton’s Laws. Probably along the lines of how I brought in my Hot Wheels cars and tracks and made a lab for my students to use them to demonstrate conservation of momentum and Newton’s Laws. Good times!